The collector is running today. It peaked at about 119F with the outside temp at 48F, so the air flow seems to be reasonable. I'll see how it does later in the season. To measure the cfm I will have to make a straight section of duct. Right now it just has Reflectix around the straight part of the ducts. Fiberglass will be wrapped around them with a black sleeve to keep the insulation warmer and reduce heat loss. The plenum at the top is painted black. It's aluminum flashing over 1.5" of insulation. It was about 100F on the black surface (52F above the air temp), so that will help reduce the heat loss from the plenum. This is the window insert installed. The output on top has magnets to keep the damper tightly closed. The magnets adjust in/out. For the input on the bottom I am going to try the fabric damper. I like the damper. Is that made from acoustic ceiling tile? How did you secure the sliding window? I had my cousin all but talked into building her own SAH, but her front windows are casement style. I tried to explain how easy it is to build an insert like yours, but she didn't understand. Too bad too as she has a large house out in the country and her bills are over $350 per month each month; And that's with a new high efficiency furnace and new windows. The damper is a piece of Styrofoam that is very flat and smooth on one side (came from box packing). The Styrofoam around the duct opening is a lower quality kind (like the big sheets at Menards). It has some indentations and is painted white, so it looks like acoustic tile. For the damper, I haven't found anything else that is lightweight and provides some insulating value for the duct opening. 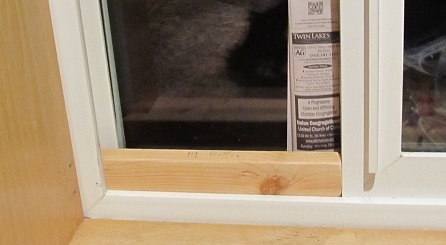 To keep the window insert tight and sealed, I just have a piece of 1x2 wood at the top and the bottom. The window insert has weather strip on all edges. With the window half open, that creates an air gap. It wasn't installed in the previous picture, but on the outside there is a strip of closed cell foam in that gap. The newspaper in the picture below is just temporary. There will also be a foam strip sealing the inside. That effectively makes the center part where the windows overlap like a quad-pane window. Going through a window, security is important. This window is 10 feet above the ground, but for the one at ground level that goes into the basement I was hesitant at first to use the window. With the wood at the top and bottom and the way the wood window insert fits inside a U-channel, it is very secure. Even if someone tore the ducts off on the outside, they wouldn't be able to reach the wood at the top and bottom keeping the window closed (the basement window is wider). The final setup for this season. Left to right: air exchanger pre-heater, new tube collector, old screen collector, 2nd new tube collector. All that is left is redoing one reflector and making one more. The Styrofoam damper is starting to degrade from the 120F heat, so I'll be switching to something else. 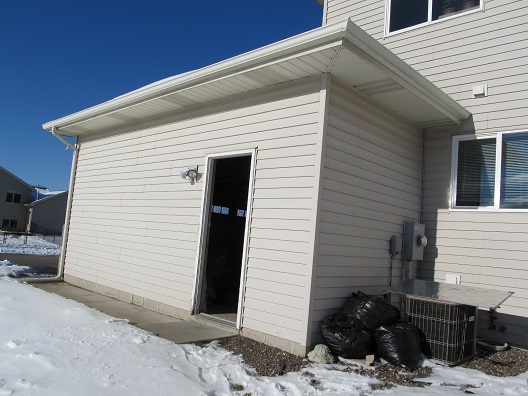 I have a south facing garage wall that I would like to use, but it would take a long duct run to get to the window. That is a reflector on top of the air conditioner. Hopefully over the next few days you will FINALLY have some decent sun to check out your new heaters. I'm still 2-3 weeks away from the sun rising above the trees in the middle of the day. Clear skies today and the big ZP didn't start cycling until 10:30. Around 11, it ran constantly, only to begin cycling again around 2pm. There are just too many branches right now for great performance. Although between the 2 collectors, I still managed to warm the basement 9 degrees. Not too shabby for shaded performance. How far up the face of the collectors do you cast a reflection of the sun? And how do the reflectors affect performance? December was way below average for sunny days. January is normally sunnier. My collectors also start late in the morning due to all of the trees in the back along the pond. The size of the reflected sun area and the amount of benefit varies depending on the sun angle, the angle of the reflector, and the angle of the collector. I haven't done any measurements in a long time. I just check the reflectors once in a while and make sure they are still aimed OK. Right now with the sun low, the reflectors need to be angled down on the center collector. 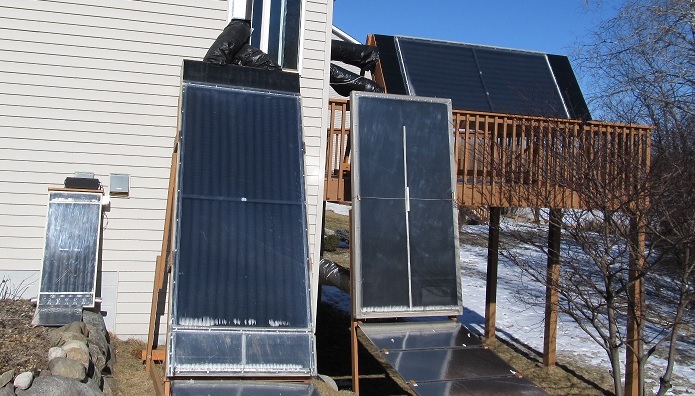 Later when the sun is higher they will need to be raised to keep the reflection on the collector. For a horizontal collector like yours the reflector angle would have to be adjusted more often since the target is only 4 feet tall. - I have a Kill-A-Watt meter now. The 3 fans in each collector use 22W AC total. 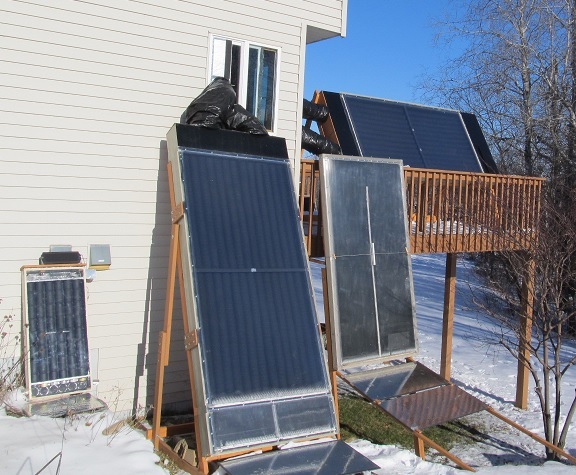 Probably not worth powering them with PV panels. - There has not been any problem with condensation inside the twinwall on the horizontal collector. Both ends are vented. The vertical collectors still get some condensation in the bottom inch or so. The cloth strip soaks up moisture. Next time I may try using a waterproof vent material. There is a plastic tree wrap that has small holes in it. - The top of the vertical collector and the two sides of the horizontal collector have aluminum flashing glued onto the polyiso cover over the plenum. It was fine all winter, but now on warm days the flashing expands enough that it warps out some. Expansion joints might help with that. - The Styrofoam flap on the hot air exit for the horizontal collector did not work very well. The air comes straight to the duct exit so the pressure is spread out evenly. On the vertical collector the bend in the duct just before the exit accelerates the air at the top of the exit so it is better able to lift the Styrofoam flap. Otherwise, no problems except the lack of sun this season when the heat was needed the most. On two of my collectors the ducting is exposed to the sun so I wrapped them in black material (black tarp and black trash bag) over the insulation sleeve. That keeps the duct insulation warmer. The inside of the ducting on the cool air input side even gets warmer than the house air, so there is a little preheating instead of loss to cold ducting. 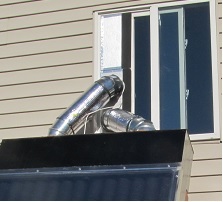 The hot side ducting loses less heat. I started wrapping my sun exposed ducts in black plastic to protect them from the UV rays, as well as help to melt any snow or ice on them. I never thought about warming the incoming air. I have very little ducting actually exposed to the sun, but there are always reflections. Nice to know this works with such short duct runs as you have. I thought about putting a clear layer over the black, but the black alone is gets warm enough. For the rightmost collector that has ducts under the deck I left them silver. The black surface (aluminum flashing over polyiso) on the plenums also helps, but when it gets warmer outside they will have to be covered (get too hot). Next year I may duct the tube collector on the left into the same window as the one on the deck. Getting everything set up way up there on a ladder is difficult. I'll lose a little flow going around the corner, but part of that south facing window will be uncovered for solar gain. Eventually they will all be redone into something much lighter and more manageable to move around. And one 4x8 isn't enough for the basement. I never got around to making the air exchanger preheater larger.